I got an interesting challenge from Joan today. Go to your pictures, open the 5th folder and post the 5th picture in the folder. It's cool how for me that was a Christmas folder. 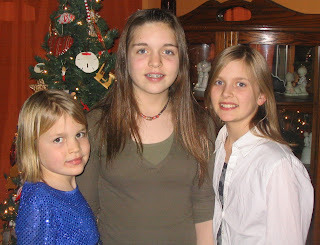 This is 2005 when each girl got a hamster for Christmas. 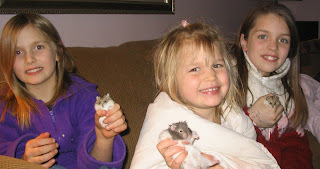 Have I mentioned we like hamsters around here? Have I mentioned Hannah bought two guinea pigs a few months ago? When we moved to this house she decided to take them to the SPCA to give them to someone else. Turns out the SPCA wanted $60 to take Daisy and Flossy off Hannah's hands. Ugh, I don't think so. However we left the SPCA with a new hamster. We went to drop off two guinea pigs and left with two guinea pigs PLUS a hamster. We are suckers. I'm about to randomly go to my picture files and continue Joan's picture roulette game. The last photo in the 12th folder. And I didn't plan that the 12th folder was a Christmas folder. This is from last year's Christmas.